Some ten years ago or so my friends and I went though Finnish Meteorological Institute automatic northern light camera films in search for moon halos. At that time I considered the northern lights as unnecessary noise that disturbed the distinction of halos on those low resolution 8 mm films. 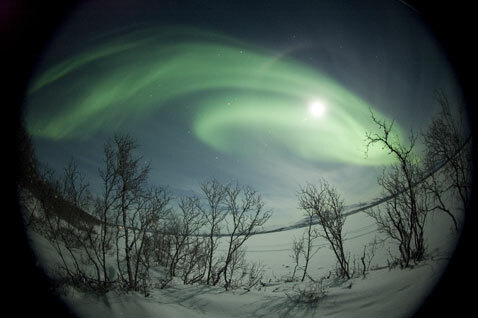 Last Thursday I was photographing a moon halo display in Kilpisjärvi biological station, when suddenly green northern lights moved fast across the halos. It was a rather nice treat and above is one photo of those moments. Also a 9° halo was in the sky on that night, as shown by this photo. Two nights later the 9° halo reappeared, but the display was much poorer.